This week we are rolling into Autumn. Does it feel like it where you are? On Saturday when I was working on my porch it was 94 degrees. I'm pretending that it's cool outside and snuggling under a blanket while I write this. Let me just say Thank Goodness for air conditioning. The mums are just about to pop open with hundreds of burgundy blooms. One pumpkin because it's 94 degrees. This pumpkin is in danger of becoming pie...on the concrete. I'll definitely get more when it actually cools off here. I did look around and find signs of fall. 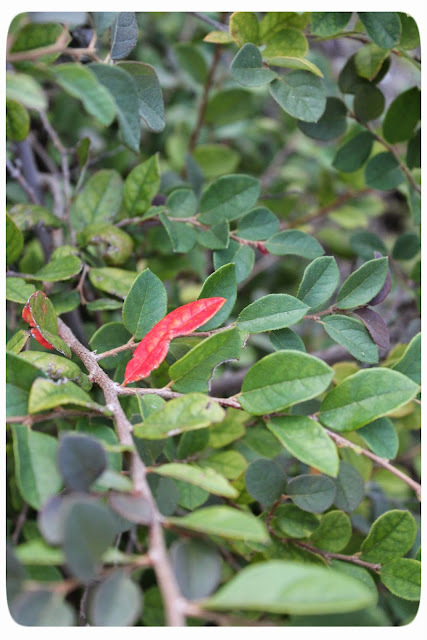 A few leaves changing colors. 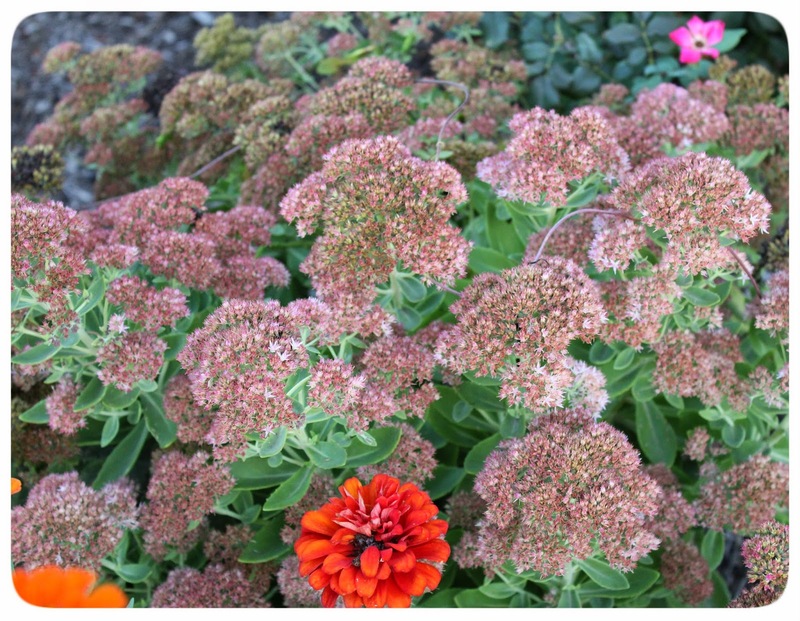 Autumn Joy Sedum in full glory. 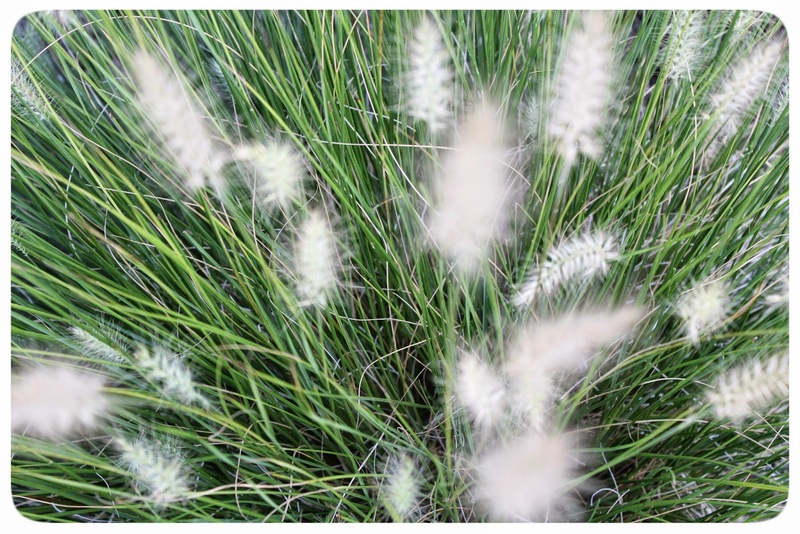 Grasses topped out with seed pods. Does it feel like Fall at your house or are you kind of pretending like me? Your porch looks so lovely and fall. Today it is hot here, but tomorrow in the 60s. I started to decorate for fall today too, Stacey...and it's hazy, hot and humid! I don't care~ I'm ready for pumpkins! Your porch looks so pretty for fall. It is feeling like fall here in Chicagoland. Cool at night and only in the low 70's during the day. Beautiful fall so far. Stacey, your porch looks so pretty and inviting…we have had a break from the hot temps …lots of rain too! Happy Fall Stacey! Despite what the thermometer says, it's fall on your porch. Very pretty and welcoming. I must admit to faking it a bit today as our temps neared 90. The good news is it's supposed to go down into the 70s this week. Yippee! It is fall here Stacey, temps in the 50's today and rain and wind. I haven't even begun to decorate the porch, though I plan to hit the farmers market this week because I am finally ready. Your porch looks beautiful! Hope that pumpkin doesn't cook! Beautifully done! 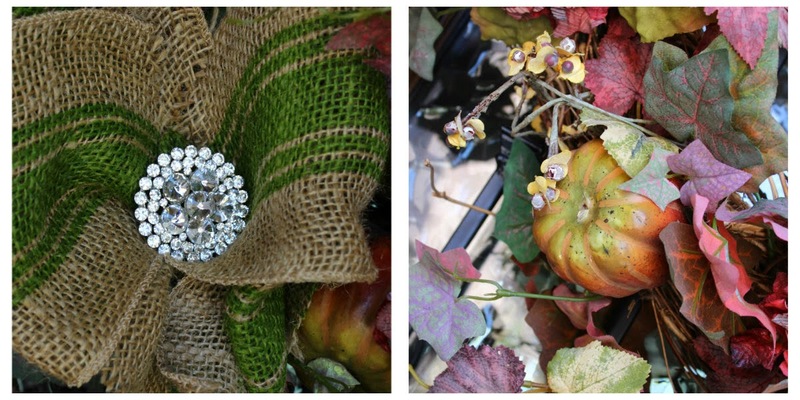 Love the pin on the wreath! I love the way you pretend!!! It is beautiful!!!! We are in Colorado as I write and it will be a real pleasure to witness ALL the colors of fall - as opposed to the yellow and brown at home. Some years it has just been green turning to brown! Pretty porch! It is beginning to look and feel like fall here. Though today it was in the mid 80's. It had been in the low 70's last week. We have a few maple trees changing color. It's hard to imagine that it's still that hot in Texas. It's starting to feel like fall here but the leaves haven't started changing yet. Very pretty wreath on your front door which by the way is gorgeous! So pretty Stacey!! LOVE your front door! The color of your brick is beautiful with the Fall colors. We would have to pretend here...it's HOT! I want to get some mums to enjoy inside! Hugs! Whoop! Gotta love the cooler tempertures that are on the way! 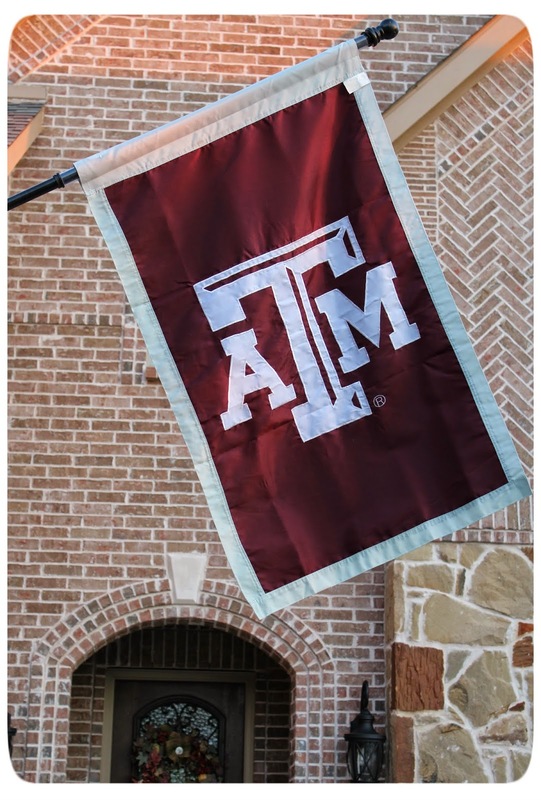 Not me, but we have two Aggies in the family, love college football. Your porch looks very "fallish" and festive, I would never guess it's 94 degrees. We went down to the 40's overnight. I'm at the lake and I'm sure I will come home later to some dead plants! Very pretty I'm loving that blingy bow :) The cool air this morning is nice too isn't it?!! Stacey your porch looks wonderful! I love the fall touches you added. Thank you so much for joining the "Falling For Fall Porch Party". 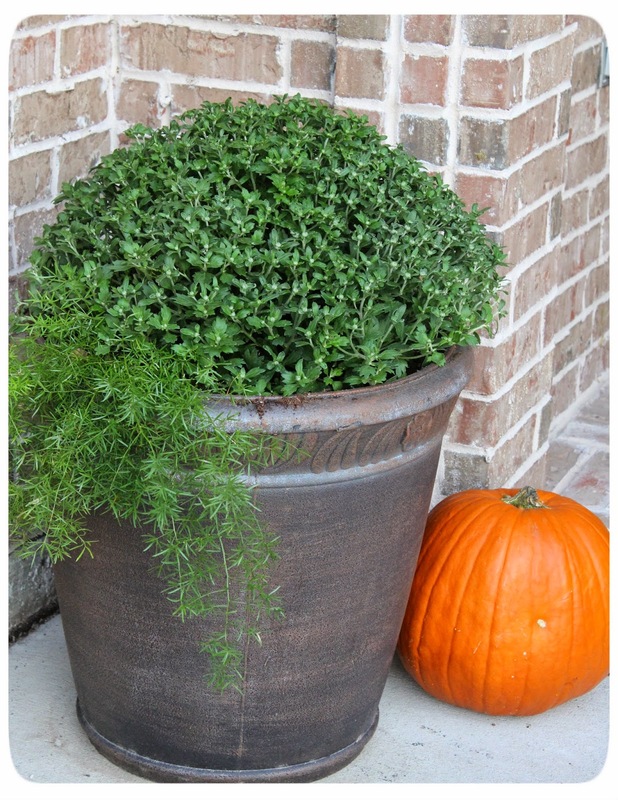 Your front porch is so pretty!I love the Fall accents; there're so inviting! I hear you about the heat! I'm facing the same issues! It's far too hot for Mums and pumpkins on my porch. Thank you for sharing your fabulous Fall porch! I love the bling on your door wreath. I'm going to start decorating for fall today. Our temps are warm & pleasant during the day. When the sun sets it feels like autumn. kinda pretending it's fall around here, although some of the trees have a hint of color and our mums are blooming. Happy fall! Your outside looks beautiful, Stacey, even though it's not feeling like fall. The only way I know it is fall is that the temps go down quickly in the early evening. Otherwise we are still walking around in shorts and flip flops all day long. I'm with you Stacey, it's too hot to pile on the pumpkins! Your porch looks so pretty, I'm now inspired to get out in the heat and spruce mine up, too! Your entry is stunning! I LOVE brick homes- especially with fall decor. Don't you think brink is just so right for autumn? Well, much to my own surprise, I can say we do not have to pretend it's fall here. Sat was nearly 100 degrees; Sun was a tad cooler and today it is cloudy and only expected to hit 77 for our high! Now that is called perfect timing in my book! i love that asparagus fern, is that what that is? it's fall here, in the philly area, so i totally decorated my front steps this weekend. it was time. enjoy! Stacey, this time of year is so exciting when there is still sun and leaves and pleasant days and pumpkin spice lattes...can't beleive it's so hot over there. It's cooling down over here in WA state so some cozy slippers in the morning is the real deal! 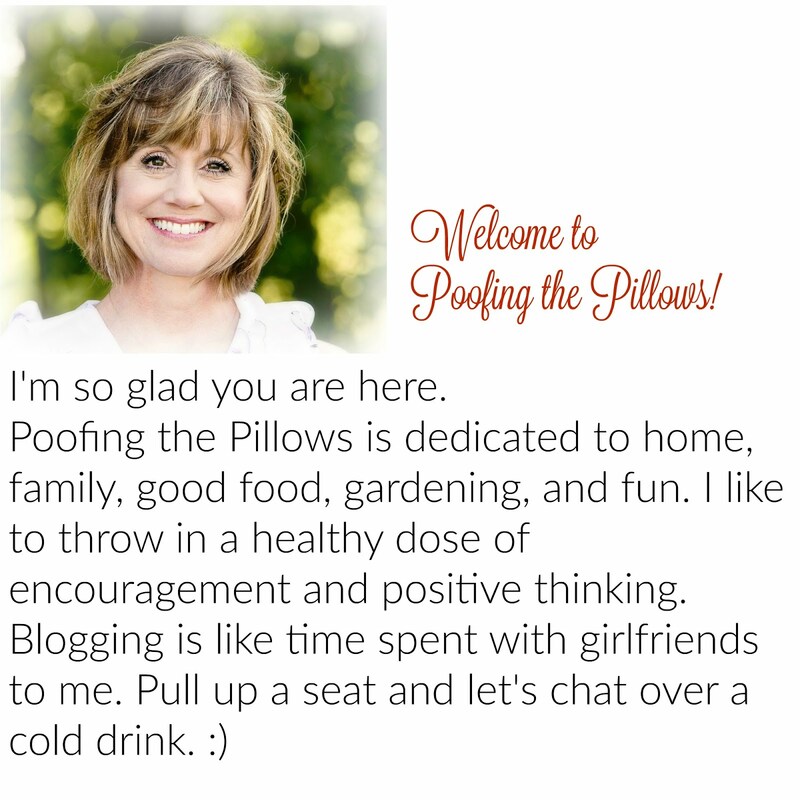 Wow, things are looking wonderful here at your blog!! It's been forever since I have blogged or stopped by! I love the new layout. Your decor is gorgeous as always and I love your pumpkin. We just started to cool off here, but I know we will have a million degree heat and humidity again before "Fall" is really here. Hi Stacey! 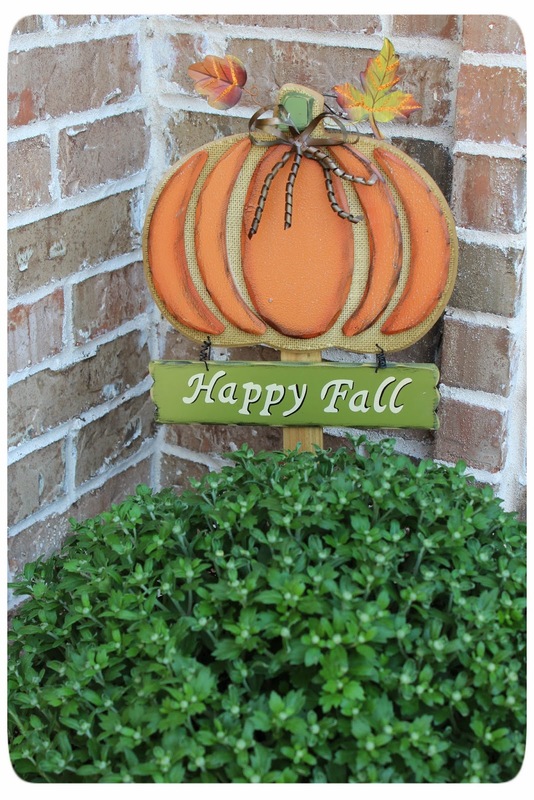 Loven your fall porch, I do imagine it would be hard to decorate for fall in 94 degree weather. Have a wonderful day! You are way ahead of me in decorating. It's been in the 70"s here and leaves are already beginning to change. I plan to start pulling my fall things out next week. Love your porch all decked out for Fall!! LOL - not quite that warm here, although each day this week it looks like it will be just a bit warmer. Saturday and Sunday it should hit 80, but with no humidity it is wonderful! Unfortunately, no rain at all, which means I have to remember to water the mums I just bought. I'm with you. I am not decorating for fall until the temperature drops a little. It was 90 degrees at my house last week too! The porch looks great! I love decorating for Fall and just like you I'm pretending the weather is cooperating ;) Hopefully next week will cool down a bit more so I can enjoy eating more Fall soups. 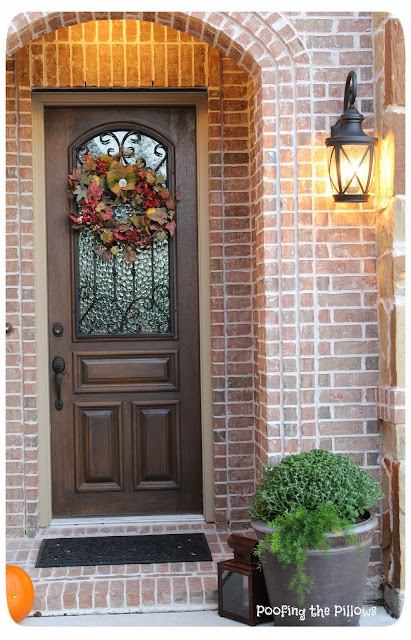 Love your front door. So pretty! First impressions are important! Your porch says "welcome" in such a pretty, festive way, no matter how hot the temps are.